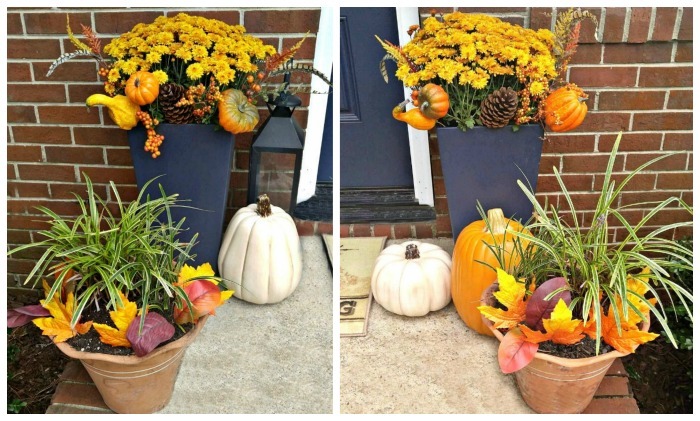 This Fall Entryway Makeover takes my front door and entry through from fall and right into Thanksgiving with natural elements and the rustic colors of autumn leaves, pumpkins and more. This post was sponsored by Lowe’s as part of an Influencer Activation for Influence Central and all opinions expressed in my post are my own. It’s time for a Fall Entryway Makeover. Most flowers have stopped blooming right now, although there are a few fall blooming perennials and annuals that will work well. Fall is just full of colors and natural elements that make them the perfect choice for supplies to use for autumn decorating. 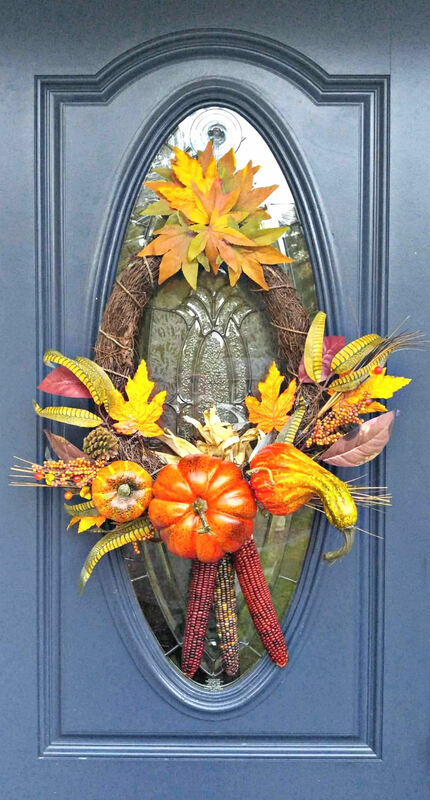 From the robust colors of fall foliage to flowering mums and on to the multitude of pumpkins, Indian corn and gourds, which seem to be everywhere, Autumn offers us the perfect assortment of items that bring life to any front entry. I like decorating my front entry anytime of the year, but when fall rolls around, I love to totally stage my front door and nearby entry. This year, my entry is getting a great make over thanks to a recent partnership with Lowe’s Home Improvement. Lowe’s has graciously provided me with products from their Fall Harvest line of decorative goods. I love shopping at Lowe’s Home Improvement. The store has super prices on the latest in decor trends for this time of the year. 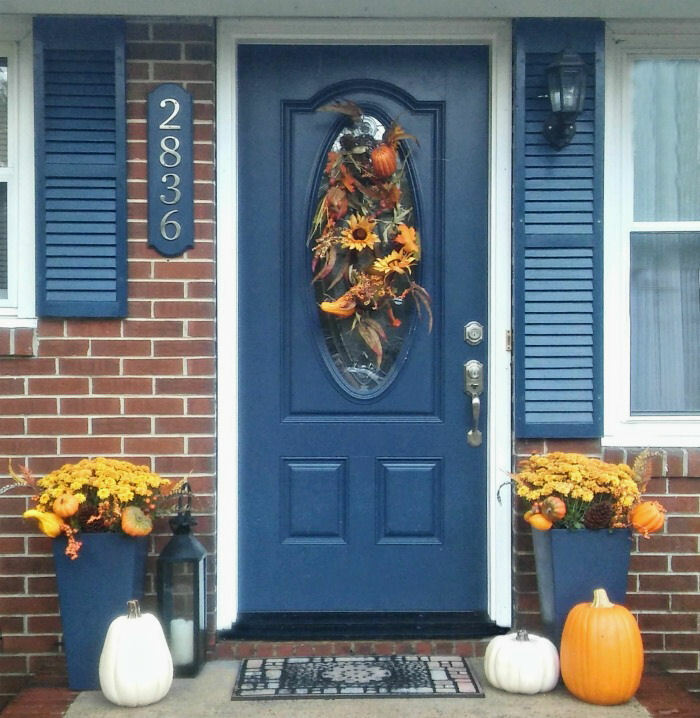 If you want to add curb appeal and welcome your guests in a seasonal way, be sure to stop by Lowe’s or visit them online to see what they have to offer for the Fall season. As soon as I entered the store, I knew that I was in for a treat. It was like Christmas morning in October for me to be able to choose items for my fall entryway makever project. Since I was staging my entry around my door wreath, I decided to pick up two different types to give me some variety and help me move through fall and then to Thanksgiving. My front door has an oval glass panel in it, so a round wreath was not the perfect option for me. 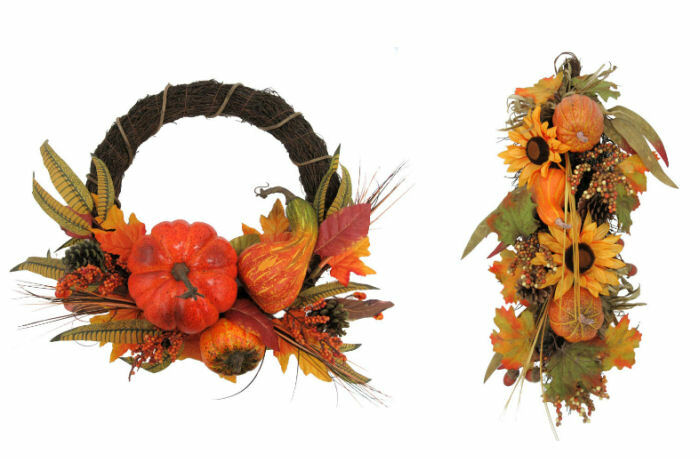 Imagine my delight to find two perfect wreath choices: a grapevine wreath, and a long Autumn swag. both overflowing with autumn colors, gourds and pumpkins. Perfect! All I needed to do was to make a few adjustments to the grape vine wreath to make it fit my door opening well. Once I had my wreaths in hand, I wandered around the display area adding other things that would tie in with my wreaths and also showcase the whole entry. My front door is a color called Naval blue and the bricks of my home are rust colored. The accent pieces that I chose from Lowe’s will coordinate not only with my wreath but with my door and bricks as well! 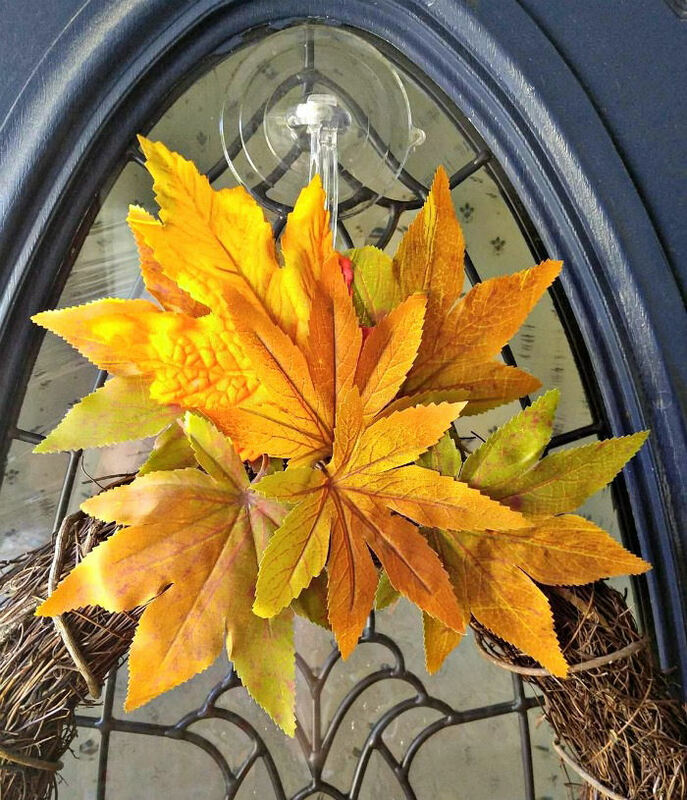 Since my project is based around my wreath, I started by placing the autumn swag in place, using a door hanger designed for glass. The swag fit the glass panel perfectly and gave me a focal point so that I can move on to staging with my other decor items. An added bonus: This swag is one long length, so it will do double duty later when I move from fall to Thanksgiving! I can use it as a door surround and it will coordinate with my grape vine wreath. Win-Win!! 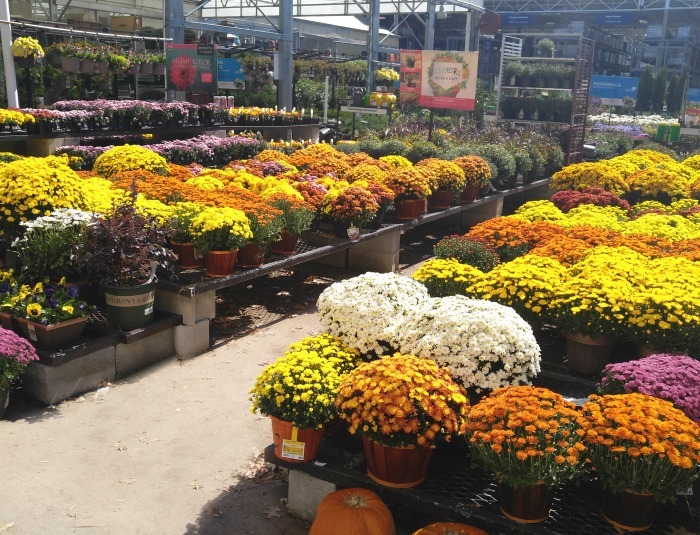 While I was in Lowe’s, I stopped by their garden center to pick up some colorful mums. The choice was vast and the colors that I chose coordinated beautifully with my Fall decor accent pieces and wreath. I can’t wait to get started on the project! I started by removing some liriope muscari variegata plants from two tall blue planters and adding my mums to them. The liriope got added to some pumpkin colored planters at the foot of my steps. The colors of the mums are just amazing. They are a sort of two toned yellow and rust color that ties in perfectly with my door wreath. Once they were planted, I decided that I wanted some extra autumn decor in them to coordinate with the rest of the vignette. 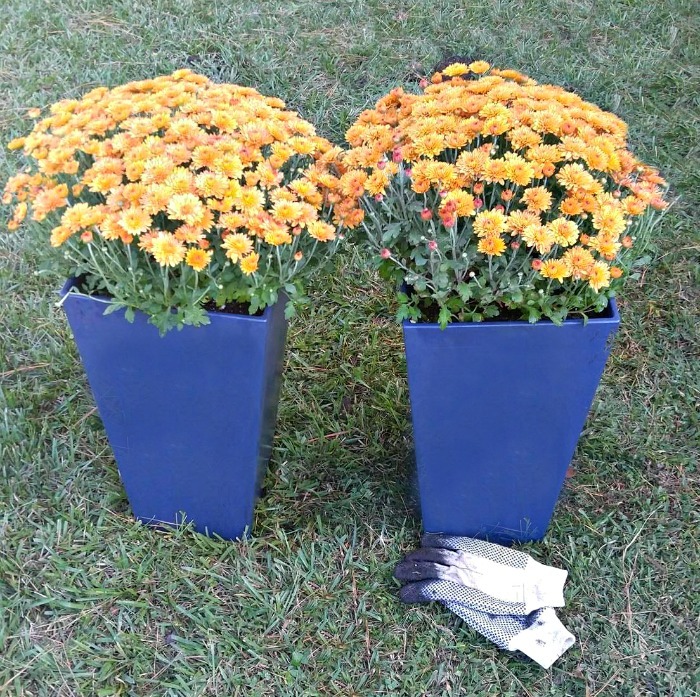 This wonderful galvanized fall planter from Lowe’s was perfect for this job. It was just FULL of fun autumn decor picks. It was intended to be a fall centerpiece, but I will use parts of it for my fall entryway makeover instead. I removed the gourds and stems from the planter and used them in my two blue planters and then later in a couple of pumpkin colored planters that sit by my front steps. The autumn picks sit just below the mums and liriope and tie in with the look of the swag wreath perfectly! The extra leaves will also be used to hide the top of the door hanger when I hang the grape vine wreath on the door for Thanksgiving.. 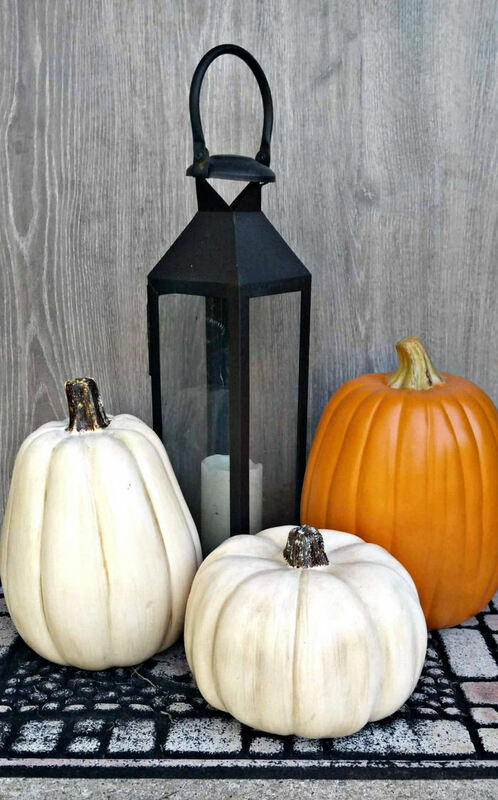 I like the assortment of sizes of them and they add an early Halloween look to the vignette when positioned next to a tall black candle holder that was given to me by my mother. Also, they have no Jack O Lantern face, so they will still be perfect for later in the fall as we get closer to Thanksgiving. All of these items go together so well and set the stage for both fall and Halloween. I just love how the colors of the fall entryway makeover look with the colors of the bricks and front door of my entry. It is so warm and comforting to come home to! Transitioning my entryway for Thanksgiving. The entryway scene above is perfect for a general fall and Halloween look. But I wanted to give it a bit more seasonal Thanksgiving flair later in the season. Luckily for me, all parts of my vignette coordinate well and transition well from one holiday to the next. The whole scene can be altered to highlight Thanksgiving by changing out the swag and using the grapevine wreath on the door. It uses the same colors, but is a traditional wreath design. Since the wreath is more round in shape and I have a glass panel in my door that is oval, I made a few adjustments to it. I used some of the galvanized planter leaves that I had left over to add height to the wreath and hide the door hanger a bit. This allowed me to position the wreath further down the glass panel. Also, grape vine wreaths are quite malleable, so I made the shape a bit more oval looking. I added a few pieces of Indian corn that are perfect for Thanksgiving on the bottom of the wreath under the pumpkins and gourds . This gave me the extra length that I needed and it now fits perfectly on my door. The swag that used to be on the door for the fall look now gets unfolded and is draped over the top of the door for extra fall appeal. Just a few pieces of single gauge wire and a couple of cup hooks and it was in place. How pretty! Don’t you just love to re-purpose decor items? 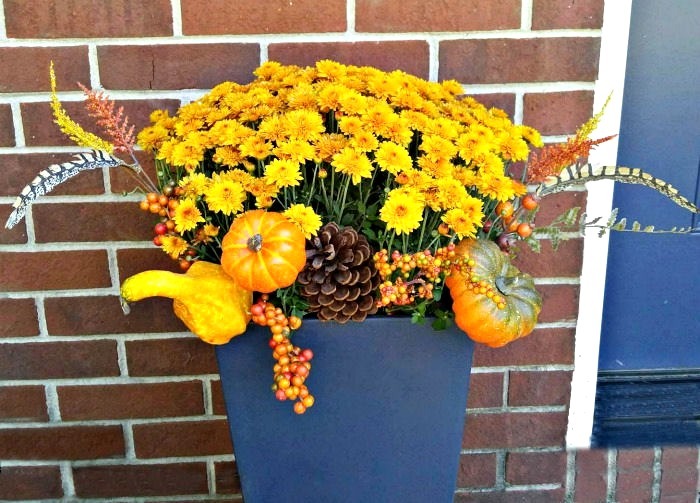 I really like the way that the colors of the autumn decor pics coordinate with the garden mums that I chose for my planters, and the way the leaves tie in the colors of the shorter terracotta planters, too. 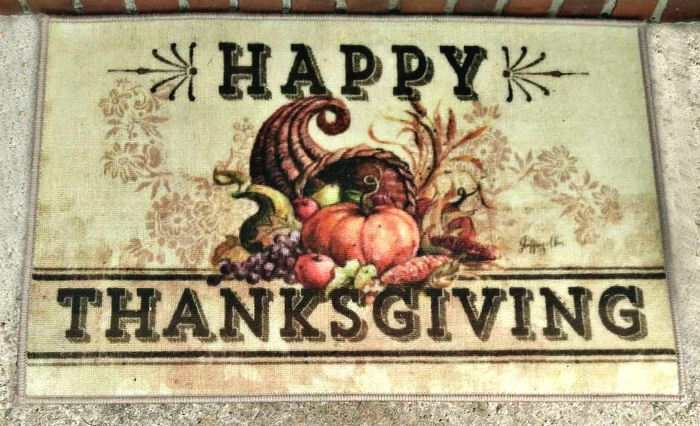 The final step in my fall entryway makeover is to add a Thanksgiving door mat in front of the doorway. How easy was that? I have a roof overhang that protects my entry from the elements, and this indoor mat gives a lovely finished look to the makeover. With just a few changes, my Thanksgiving entryway makeover was finished and is ready to welcome my holiday guests. Lowe’s makes it super easy to duplicate the look of my fall entryway makeover with the stoppable image above. Just hover over any of the products and click on the tags that appear to see more details of it. You can also click on the “Shop the look” words in the popup window to go to the Lowe’s page to see more information or to purchase the individual items. For more decorating ideas, be sure to visit Lowe’s on Facebook, Twitter, Pinterest and Instagram. They have hundreds of ideas for decor that you can use for inspiration. And thank you to Lowe’s for providing me these wonderful fall items to help with my fall entryway makeover! 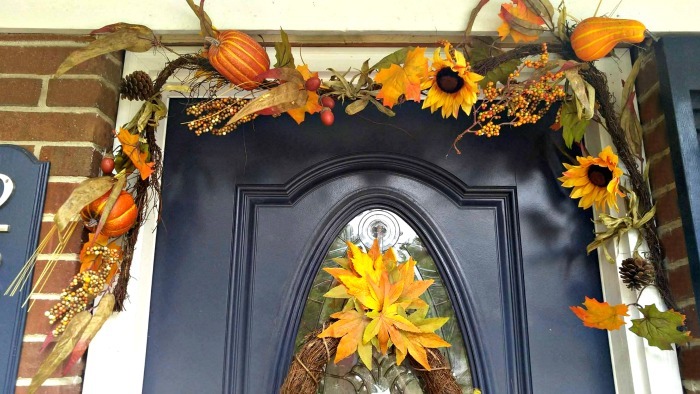 What do you do to decorate your entry for fall? I would love to hear your ideas in the comments below! 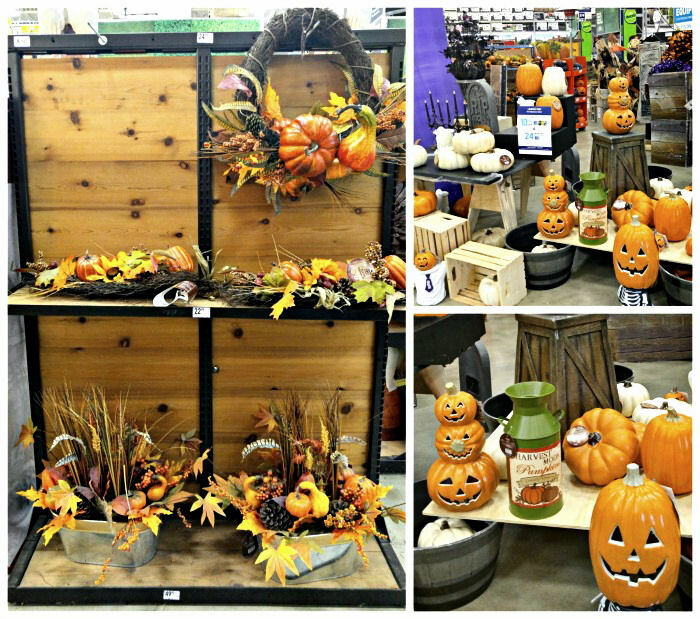 Oh my goodness how amazing does your fall entrance way look! I am loving all the autumnal colours you have going on! You did a really good job of decorating there. My house could use your touch. It is so boring in my house it could use a great update. Gorgeous. I never knew Lowe’s had so much home decor and your decorations are absolutely beautiful. I love how you transitioned from Autumn-y to Thanksgiving. Beautiful, simply beautiful. I just love this decor. How lovely! I need to do something like this. The colors are all so pretty. 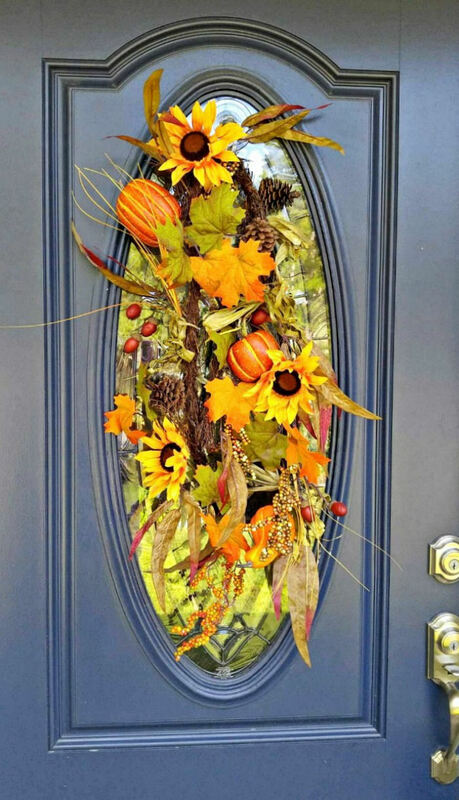 These are great way to decorate your front entrance for fall. I love to decorate for each season. I need to get a new wreath for my door. How pretty! You picked out such a nice variety of fall items. I am so late buying mums this year, I will have to see if they have any left. I started to pick up some mums at Lowe’s today. I need to finish decorating my front porch for fall. I love what you were able to do with the mums. The arrangements look so pretty! I really need to do something with my entryway! My decor only consists of pumpkins. I need to add a bit more style into my decor. Your steps look nice. We don’t decorate the front porch for fall. I have two inflatables that I put up in the front yard for Halloween and that’s about it. I’ve never used inflatables but a few of my neighbors do. Simply exquisite. The colour coordination is mind blowing. The door looks so beautiful and you seem to have seamlessly blended together all the colours of fall. Thanks for the kind comments Sandy. We usually decorate with only a wreath on the front door. I am not that crafty so I get the pre-made ones at the store. The flowers are a good idea. I might grab that idea and get some mums and a pretty planter too. There are so many colors of mums available. I was surprised to see how many varieties the garden center had. I always enjoy it when people spruce up the look of their house with an autumn motif. Nice job with your decorations. They look great! Thanks Tim. This is one of my favorite times of the year to decorate. We love decorating the front of the house for the holidays. Thanks for giving me some new and fresh ideas. These are such cute ways to dress up an entrance. I haven’t bought any mums yet because it’s still warm here and they tend not to do well in the heat. I will though as soon as it cools off some. Beautiful! I am looking to buy square planters like the ones you have pictured. Do you remember where you got yours?